Our Portland store just turned 1 in August and we can’t believe it! 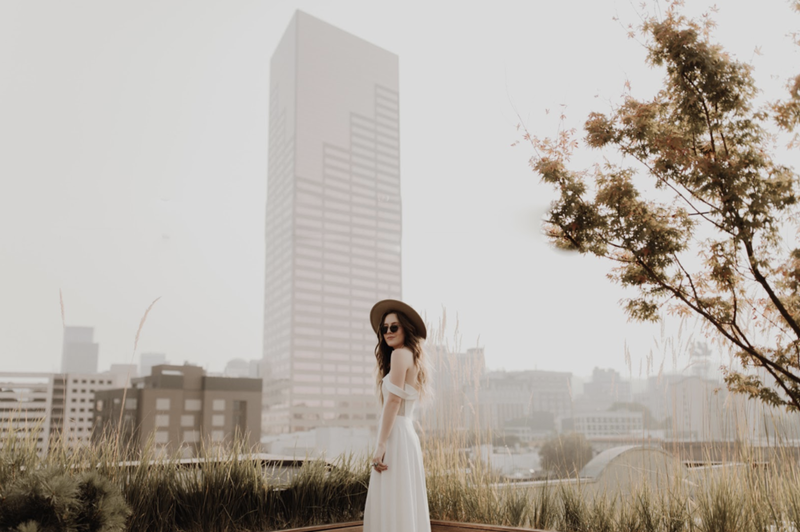 Since August is generally the quiet before the storm of busy season, what better time to celebrate our first year then doing it with a very Portland styled shoot! In order to make this successful, we knew it had to feel authentic to our awesome city. The first thing we did was pick dresses we felt aligned with our specific bride and her many different sides. We needed something slightly romantic, modern & sophisticated, with quirky details! We sourced these dresses from 3 designers that the City of Roses has continually gravitated towards: Truvelle, Jane Hill, and Rose+Williams by Tara LaTour. Once the dresses were picked, we knew that we had to get a dream team together. 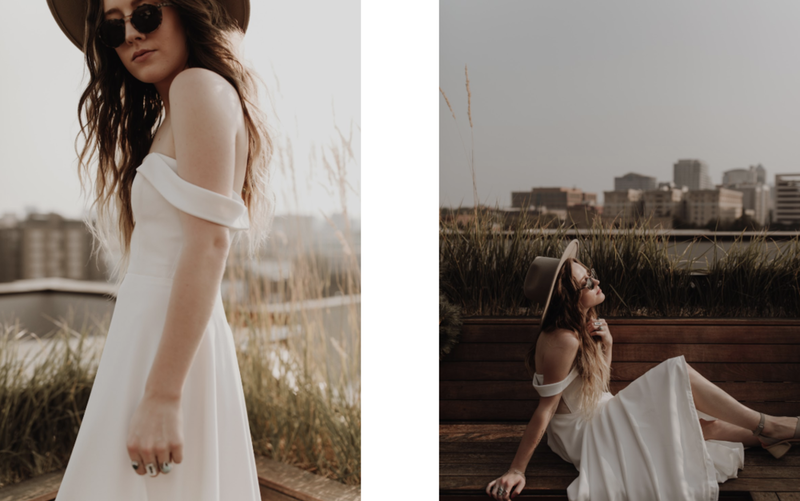 We brainstormed, instagram stalked, and fangirled our way to the decision that we wanted nothing more than to work with Portland influencer Sam Landreth, and photographer Olivia Strohm. So we crossed all of our fingers and toes, and asked them if they wanted to do a collaboration with us. Much to our absolute glee, they did! We knew that they would bring their own individual aesthetic, and that we could honestly just let them be the creative geniuses they are. Sam Landreth has the uncanny ability to style everything perfectly with small details, and somehow it’s never too much. Olivia makes the world feel equally beautiful and moody in a way that you can’t stop looking at. Without too much of a plan and with a lot of laughs we drove around different sectors of Portland, stopping & grabbing pictures when something caught our eye. We hope you enjoy looking at the images below.This is our little love letter to this beautiful city and her people, and we want you all to know how much we appreciate the love and acceptance we’ve gotten from day 1. This salmon colored building in SE had a very 1970s feel. It also had guys in their car bumping 1980s rap. Vibes man. This amazing dress is Alannah from Truvelle’s newest collection (which we’re doing a giveaway for! Check out our IG here for the rules! ), and it has this very romantic, whimsical vibe between the darling lace and gorgeous chiffon. Plus cute little tassels tie at the back! We made our way down to Chinatown and decided to commandeer the rooftop of the Society Hotel, which had the most spectacular views of the city. It was 94 degrees outside, but these shots were definitely worth all the “glistening” we did up there. This stunning gown is Bryant by Tara LaTour from her Rose+Williams line. It has mesh side panel cut outs, off the shoulder straps, and is made from the nicest crepe. Sam made it completely her own, and man do we stand by the hat/wedding gown situation happening here. We decided to switch into Meredith, another brand new Truvelle dress, grab a drink and then head out. Olivia playfully grabbed photos of Sam in the elevator, but someone actually called it & Sam had to retake the ride up and all he way down by herself in this wedding dress. Many laughs were had during this part. We made our way over to the neighborhoods by NW 23rd, and just snagged pictures in front of some of the most stunning houses by Nob Hill. When Sam put on this very last dress, Olsen by Jane Hill, she literally stole our hearts, breath, and minds. It draped on her perfectly and she had the cutest matching clutch she paired with it that was actually her moms from when she walked down the aisle! 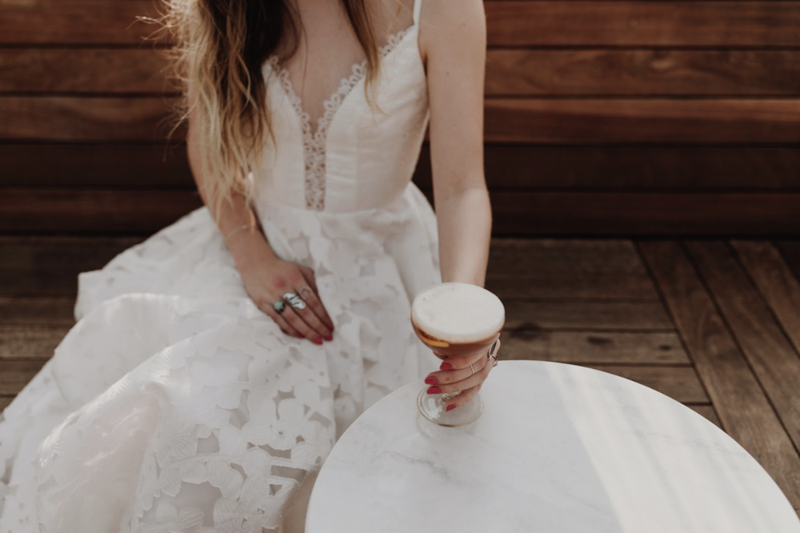 The texture in this dress was so incredible and Olivia captured it perfectly. She left no angle un-captured, and even crawled on the street to get some of the best shots! Portland, we can’t thank you enough for embracing us! A major shout out to our two collaborators @Samlandreth and @Oliviastrohmphoto, who are truly gems. Lastly, Sam has been awesome enough to offer 10% off her Portland City Guide for all of our aandbabes! Find some of the best spots to eat, shop, and explore! Follow this link , and use the code “AANDBABE10” at checkout for your discount!